Dear Zoo is one of my preschoolers favourite books so it seemed only right to create a round up of Dear Zoo activities and crafts as I’m sure there are lots of other kids who feel the same! I wasn’t sure at first how many I’d be able to find but after asking a few bloggers for assistance I was overwhelmed by the most amazing selection of Dear Zoo activities, I’m sure you’ll love them too! Some of these are zoo activities for kids while others are specific Dear Zoo activities. There’s a really good range from Dear Zoo literacy activities to colouring sheets and crafts so I’m sure you’ll find something that’s right for you and your kids. The Dear Zoo activities I’m sharing today are all in the same order that they appear in the image below, but of course there’s loads more than just the ones in this picture so make sure you check them all out for loads more ideas. 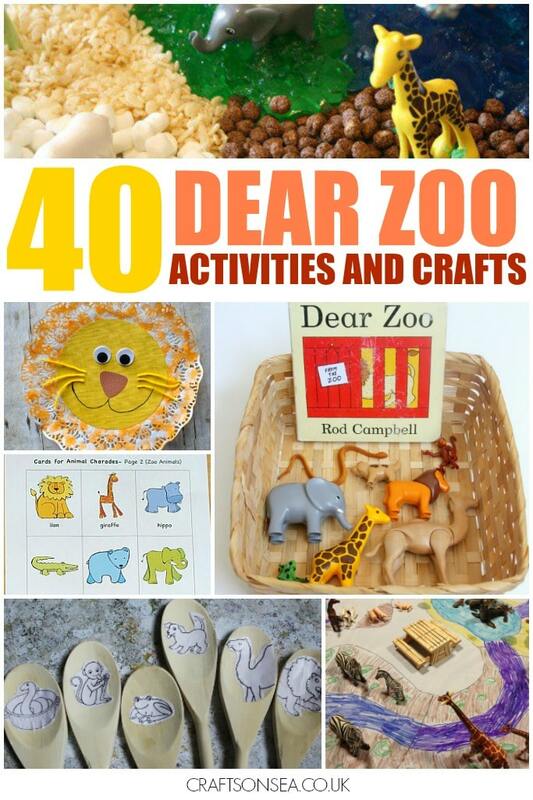 I’m shared all the activities first and then done a separate list at the bottom of Dear Zoo animal crafts for kids as there were so many great ideas to share. I’ve also included some more zoo animal books you might enjoy and if you enjoy this round up then at the bottom of this page you’ll find some links to some more of my favourite activities for kids books. Fantastic Fun and Learning has an edible small world zoo that might just be my favourite activity because marshmallows. We’ve always been a big fan of Tuff Spots and this would be great for that! There are loads of Dear Zoo activities and crafts on the Dear Zoo and friends site with a spot the difference, colouring page, Dear Zoo lion mask and a Dear Zoo follow the path activity sheet. The TES has four Dear Zoo literacy activities that are free to download here including writing container labels and writing a letter to the zoo. This zoo small world from Teaching 2 and 3 year olds was originally designed for the book Tuff Spots but I think it works really well as a Dear Zoo activity for kids too. Toddler Approved have a whole week of zoo learning activities, I think this animal salt painting might be my favourite as it looks so pretty! If you love reading zoo animal books with your kids then these are some more we think you might enjoy! We made this elephant suncatcher as an Elmer craft but by using grey colours instead of (lots!) of colours for Elmer it would work well as a Dear Zoo craft. This lion craft for kids uses pom poms to create the mane. This easy snake craft is perfect for helping kids to practice their scissor skills. Make a paper bag puppy that kids can use as a puppet too. We made this toilet roll dog craft for Valentines Day but it could be easily adapted by not using the hearts. Oh I loved this book when my kids were smaller. Such a lovely selection of craft ideas. Love these craft ideas! 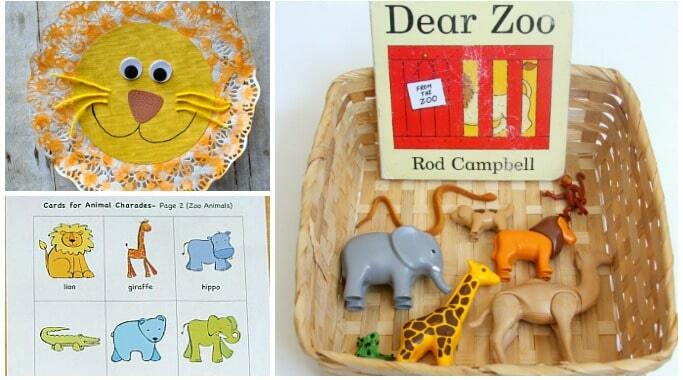 Dear Zoo is one of our favourite picture books – will keep these in mind for our next rainy day craft session. Thank you for including our zoo small world play – this is such a fun collection! 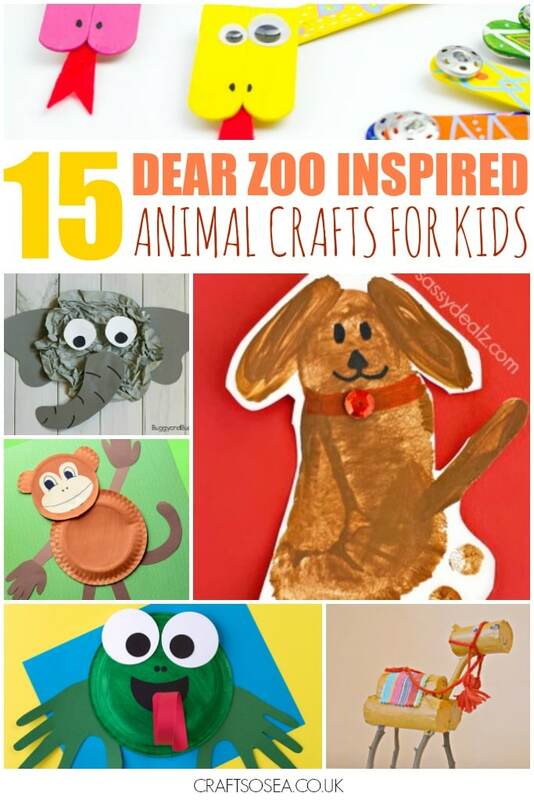 We love this book, and who doesn’t love zoo animals, I love all of these crafts such fun ways to bring this wonderful book to life.